Mousers are made too already. I'm not liking that life size Casey mask at all. I see a 1/6 one in the pile of accessories though on the far left. Also see the shredder gauntlets, some premutated splinter & turtles, an utrom, and pizza. God that Casey mask is awful....yuck. Each turtle has the same facial expression as its NECA counterpart. It's like all they did was just make them in a larger size and paint them with the original Playmates color scheme. What's next April, a mouser three pack and then stopping the line there? Blatant ripoff. I do like them but probably because I like the NECAs. I see a blaster in the pile to the left as well. What is that star fish like creature in the pile of accessories?....Orphan Alien? Hopefully there will be four baby turtles total and an ooze can as well. Last edited by The Fifth Turtle; 07-08-2015 at 05:17 PM. As cool as they do look, I'm not that fan of the 1/6 scale and these look too similar to the NECA's I already own. To give a variety to my collection, I'd rather put my hands on the classic series by playmates. If you have neither of those sets, this set is fantastic as long as you can afford it, but I'll defenitely PASS. I love Raph's unmasked alt head. It's not too often you see an unmasked TMNT figure. Look great to my. The only thing I'd maybe like to see them change is to bring Raph's skin slightly more inline with the others as it looks a lot brighter in that picture. I just wish these weren't one month apart each. That's going to be brutal on the wallet. The only thing I'd maybe like to see them change is to bring Raph's skin slightly more inline with the others as it looks a lot brighter in that picture. I'm with you. These are my only issues, the price point & Raph standing out. Oh, & that they all share the NECA expressions. C'mon, surely they can be more unique than that while still conveying their baseline personalities. They look awesome though. Really digging the accessories. Seems one is a sentient pizza monster...? 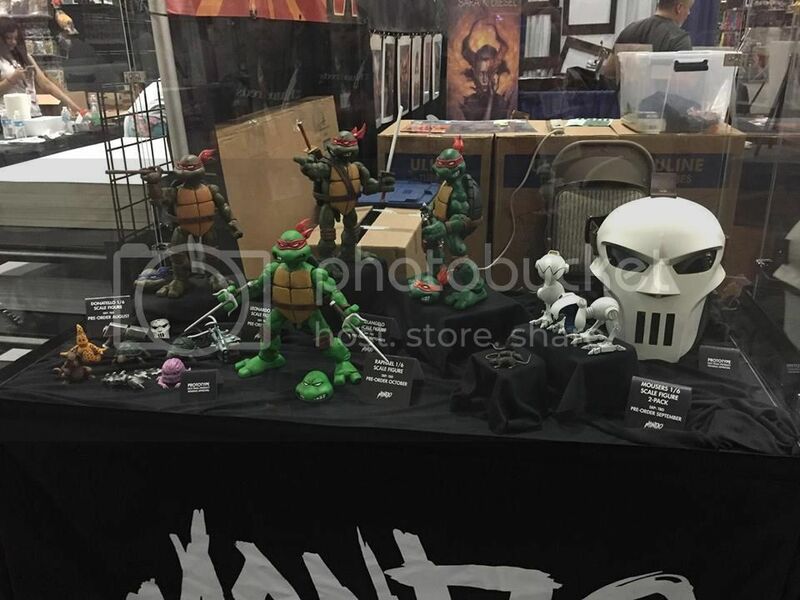 LOVE that maskless Raph head, wow. Seems Donnie comes with that blaster from the Kirbyverse, very cool. They all need to be similar colors. I get the reference to playmates, but how about, no? I'd like to see them all in Leo, or Don's tone. Would also be nice to see the weapons more detailed and chromed instead of silver paint. I dunna...I feel Raph's color is the best....it's only "distinct" because they seem to be using the old Playmates color scheme. I guess, sure. Just not into the drastic variation. I'm not against them all being slightly different (being honest I'd love them all in Leo's skin tone) but Raph's is just too bright in comparison, he stands out too much. Make him a bit brighter sure but not that much. That's how the original Raph was painted. It's an obnoxious green. Ok, just seen the Mousers too! Not sure how I missed those! This line is definitely going to hurt my bank balance! Can't see the date on Leo but I'm guessing this month since we know he's coming first. Yeah but that was a $5 toy not a (likely) $150-200 collectible. Plus isn't this line meant to be based primarily on the original comics where they were all the same colour? I get they want to put in nods to other things, like the Playmates colours, but I just feel the green needs toning down a bit on Raph. I wonder if the fan base can voice our concern and get his color muted prior to production? Doubtful, but I guess there's a better chance they'll listen than Playmates. Direct me where to say something, & I will. I would definitely get behind an email or FB spamming campaign. I'd say Facebook and/or Twitter are best bets. Just tweeted them now. Yeah, the expressions look very similar to the NECA figures, so that's an easy pass for anyone who's got those already. Is that Kirby's gauntlet to the right of the accessories, though? Because if that actually fits on Donnie's arm, that is a great touch. I want the accessories more than the turtles themselves. Those mousers and the little utrom are so cool. And I'd like a little Casey mask for many reasons! The more I think about it, the more I think I might pass on these, as cool as they are. They will surely have a high price point and they're an awkward size to display for my set up. Too big to fit into my Revoltech/Figma section and too small to go nicely with my X-plus kaiju or other big guys. I guess it depends on the price. And noooo joke on Raph's color. It's a nice color, but way too different from the other three. I'd like to see more pictures of everything though. Since I never got the Neca figures, I may just get Raph and be done with it. I'd like to get all of them but I'm up to my eyeballs in preorders. There's just too much TMNT stuff to keep up with. I'm really hoping they change Raph's color because it stands out way too much when compared to the others. What an odd color choice. I dunna. NECA's team was all about that green. Buying him alone wouldn't be as shocking as when teamed with the others.